﻿The goals of the Genealogy Group are to share genealogy research experiences, help each other with suggestions and research tools, explore new genealogy methods, and generally to enjoy the adventure and pleasure that genealogy can provide. Many people think "genealogy" is just about building a Family Tree - well, this Group is about far more than that! What were our ancestors daily lives like? How did they get their name? How did politics and war affect their lives? How does archaeology, DNA science, and other discoveries affect our lives today? 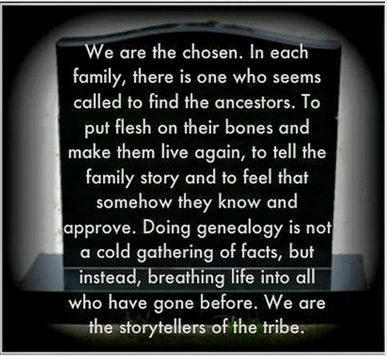 Every ancestor has a story to tell, and our lives are enriched by exploring and sharing our family history.